Billy Butler endured the same type of trade rumors last off-season. KANSAS CITY, Mo. 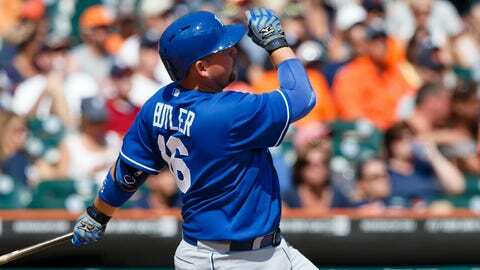 — Royals designated hitter Billy Butler didn’t get too frazzled in recent weeks when he heard his name pop up in endless trade rumors. "I’ve been around long enough now that, you know, every year there’s rumors about me (being traded)," Butler said Friday at a media gathering at Kauffman Stadium. "Since I’ve been in the big leagues, (rumors have) been going on for a while now. But I’m still a Kansas City Royal so you take those rumors with a grain of salt. "I never got a call from (general manager) Dayton (Moore) so I knew nothing was serious." Butler said he was never tempted to call Moore himself to find out if he indeed was on the trading block. "There’s no reason," Butler said. "He’d let me know what was going on. There was a lot of speculation, especially at the Winter Meetings. That’s what those (meetings) are all about. That’s what everyone thrives on there. That’s why everyone is in one spot there. There are a lot of moves made there but there are a lot more that are talked about that are never made." There was no specific reason for Butler to have a news conference Friday but because he was in town to Christmas shop and to attend Sunday’s Chiefs game, Royals vice president of communication Mike Swanson indicated Butler and the Royals thought it was a good opportunity to meet with the media. Butler reiterated throughout his session with reporters that he is not concerned about being traded. "I’m more worried about my Fantasy Football team than (the trade rumors)," he said, smiling. "Things pop up. My wife and my dad get alerts (on their cell phones) on what Kansas City is doing and the Royals are doing. In a roundabout way I know what’s going on." Butler said he endured the same type of rumors last off-season. "There was speculation about me going to Seattle," he said. "Then I got a call from Ned (Yost) and Dayton and they both said, âThis is not coming from us. Of course you’re being talked about because you had a great year.’ They both just called to let me know I wasn’t going anywhere. "They can only control the stuff that comes out of their mouths. Rumors are rumors. There’s a ton of them." Interestingly, though, Butler didn’t get the same reassuring call this off-season. "No, I didn’t. But they told me last year," Butler said. "It’s not like they have to re-warn me. They let me know last year and there’s no need to tell me again." Butler also was anxious to talk about Moore’s additions to the team — Norichika Aoki, Omar Infante and Jason Vargas. "We’re adding to a team that just missed the playoffs," he said. "You have to be excited about that. "Going into this season, on paper, and paper doesn’t mean anything, but there’s not an area right now that needs to be upgraded. "We’re 100 percent better. We’ve upgraded pitching. We’ve upgraded offense and there is already so much potential there. Last year wasn’t our best year offensively. We’ll continue to get better because we’re young. Young guys get better with experience. We’ll be fine."